The 14th edition of the Cyprus International 4-day Challenge is now a beautiful memory and we would like to thank all participants, sponsors, staff and volunteers that made the 2018 challenge a great event!!! Preparations for the 15th edition are already underway, and we would be glad to welcome “novice” as well as “experienced” Challengers back to our island between the 21-24 of November 2019. The half marathon and 10k Paphos City Run will remain open for runners not participating in the full 4 day event but would like to experience the challenge. 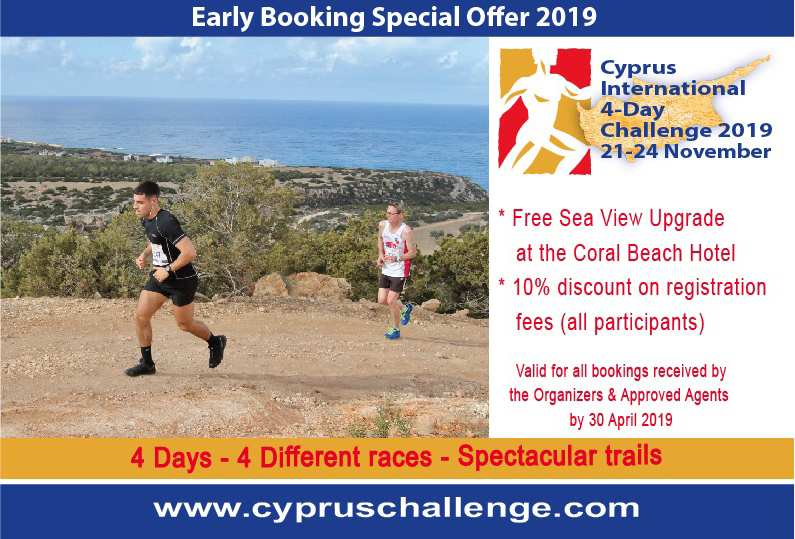 All in all, the Cyprus International 4 Day Challenge 2019 event covering a distance of 48Km in total, is greater than an official marathon which stands at 42.2Km. Browsing through the website, you will find a wealth of information on the event’s organisation, runners’ comments, press reports of the running community, picture and movie galleries and of course entry details. Keep up to date through our social media Cyprus International 4 Day Challenge » and Arena Cyprus ».